This was my very first time making (and eating) ratatouille, and I’m happy to tell you that it was a great success! Yes, what I have read on the net about this French dish was absolutely right. This is such a tasty, nutritious and hearty dish that you would want to recommend to someone. But oh, I was wrong – so very wrong – and I’m glad that I was. This is such a wonderful dish with all tasty flavors of summer vegetables condensed together! And yes, it is so good with French bread and white wine, and tastes great warm or cold, just like so many people mentioned on their websites. My dinner today consisted of baked breaded horse mackerel (with cheese and herbs), ratatouille, a few slices of French bread and Riesling wine. How about that? I must tell you that I enjoyed the tasty veggies on the bread slices, and finally wiped the plate with a piece of bread. Yum! BTW, I have been wanting to take a photo like this for a long time. A close-up of cut vegetables... with nothing else, just vegetables. Nothing fancy, yet beautiful, refreshing and even healing (to me, at least). It's amazing how photogenic vegetables and fruits can be. I often think that they can be more photogenic than flowers. Now this simple and tasty dish has become my true favorite. 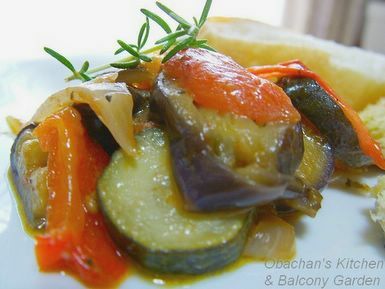 I wish I would be able to make ratatouille with veggies from my own vegetable garden someday. Oh, that would be so wonderful, don't you think? Could you please post recipes for your decious looking Ratatouille and also you r muffins. Your photos are always so wonderful and inviting. This looks so delicious. Your photos are beautiful. I agree that vegetables and fruits can be very photogenic -- almost like a work of art sometimes! I've never had ratatouille, but it looks like it's right up my alley. 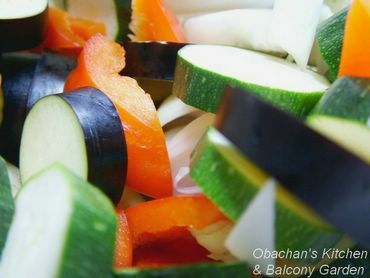 I can't wait 'til you post the recipe, obachan! i love zucchini in dishes. we're selling them like mad at work. if you can find them, get some zucchini blossoms. they're great as tempura or in omelets (omuraisu, perhaps?). Thank for your nice comment. 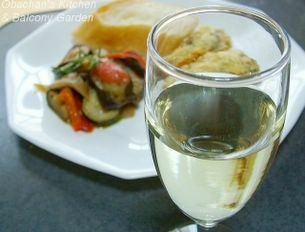 As for ratatouille, it’s very easy to make, so I don’t know if I can call it a recipe. Just chop up your favorite summer vegetables. Heat olive oil and minced garlic in a pot, sauté the chopped veggies, season with salt and pepper, add your favorite herbs (I used bay leaves, thyme and rosemary) and cook for apx. 15 minutes or something. That’s it. None of the Japanese websites I went through bothered to mention the amount of the ingredients and seasonings. Oh, but this is important: Do not add any water or soup stock or anything. Just cook the veggies in the juice that came out of them. IIRC, one of the instructions said cook with the lid closed until the veggies are soft, but cook uncovered for the last 3 to 4 minutes. Hope this helps. For the muffin recipe, please email me at my address in my profile. TKS. If you like olive oil + garlic combo, I think you’ll like this. See my reply to the anonymous commenter above. Yeah, I’ve seen a post about zucchini blossoms in someone’s blog the other day and felt very envious. I’m seriously thinking about talking my dad into growing zucchini in his vegetable garden. That must be the only way I can enjoy zucchini flower tempura. Love garlic and olive oil. Thanks, obachan! 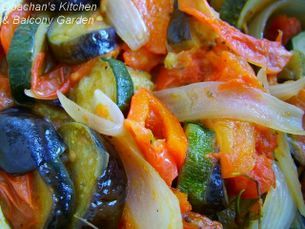 It looks wonderful indeed - I love ratatouille, the colour and flavour really cheer me up :) I always feel like 'I don't need anything else' when I have freshly picked vegetables - they are full of flavour, absolutely delicious! I wanted to add yellow paprika so badly to make this dish more colorful, but for some reason, I couldn’t find any at the three supermarkets I went to that day.